Speaking of Boro Baba (Baba Allauddin Khan) | WhatsTheScene? The sum and substance of Baba Allauddin Khan’s life was music. He quested true musical knowledge, nurtured it with a devotion and determination so severe that it kept him up at all hours, practicing and perfecting his art in all its detail in ways that could certainly appear harsh to others. But the nature of saadhna – the true nature of saadhna – is quintessential, single minded pursuit of the one thing that matters more than all else. For Boro Baba was a Saadhak – Music his Saadhana, his way to God. Growing up in Maihar, one heard this constant refrain “Ekai saadhe sab sadhe; Sab saadhe sab jaaye” (Aim for one and you’ll find plenty, Aim for all …come away empty). Boro Baba’s life exemplified his belief in single minded purpose. The unsought bonuses of this pursuit followed, and were welcomed with love and care. His home was constantly filled with students, his lands tilled and yielding rich crops, his grandchildren playing and learning and his sons and his wife and daughter and daughters in law, there to do his bidding, safe in the sanctuary of our beloved Madina Bhavan, Maihar. But the constant thread that held this growing material tapestry was Music and Saadhna! If one was wise enough or fool enough to choose this way, then this was the only way forward and the price was to forget all else, including self. To be a saadhak of sacred Music was to him, something that demanded sublimation of all else. He did not want anyone to know the hunger, the pain or the humiliation he had, in his pursuit of Music. Every one of his students had a bed, a place to bathe, and meals with a little sweet afterwards. He could be so moved by a beggar’s plight that he would give away the lungi he wore to a point that Boro Ma had to tear up her sarees so that her husband could be clad. The Maihar Band was built of orphans,of the poorest of the poor, children bereft of parents by war, and the handicapped because Boro Baba gave what he had and in doing so, helped build a life. If Boro Baba had one fault, it was this – he saw himself in his students and treated them with the same self imposed severity. Why? Because, like someone who had discovered that fire can burn one, he chose to be protective, perhaps overly and terrifyingly protective of his charges. But this very same entity that could fly into a rage over work or principle could be a gentle, childlike being at meal times or when he sat in the courtyard on his charpoy being silly with the rest of us, pulling pranks and wooing and teasing Boro Ma (great grandmother) with his violin. As a child, music played a special but non-integral part in his family of well heeled landowning farmers. It was an inheritance he created for himself through a vigorous and authentic encounter with incessant impediments, dealing with them with the tenacity of an embryo clinging to life in the face of certain death. He re-emerged as he was meant to be – the ultimate Guru who chose to treat his cup of Gurumukhi Vidya as the sacred chalice from which his students would drink unreservedly. He chose thus to distance himself from the stingy ill will he had himself faced. Never would another musical seeker know what he had. The Grand Old Man of Indian Music, as Baba Allauddin Khan came to be known, lived to be 110 years old. He was born in 1862 in the village of Shibpur – Tripura, now in Bangladesh. His father Sadhu Khan and older brother Fakir Aftabuddin Khan became the involuntary catalysts of his musical resolution that made him first seek the company of saadhu musicians at the local temple and then escape home, heading towards his destiny at the sparkling age of eight. It took almost 30 odd years of bleak circumstances and a host of celebrated teachers later that Baba Alauddin Khan was made the official disciple of the Senia Gharana under his Guru Wazir Khan, a direct descendant of Mian Tansen. Years later, Maharaja Brijnath Singh of Maihar State took permission from Wazir Khan Sahib and with his blessing appointed Baba Allauddin court musician and made him his Guru in Maihar where he eventually settled to teach. In 1926 he started his music institution by teaching war orphans and destitute children. 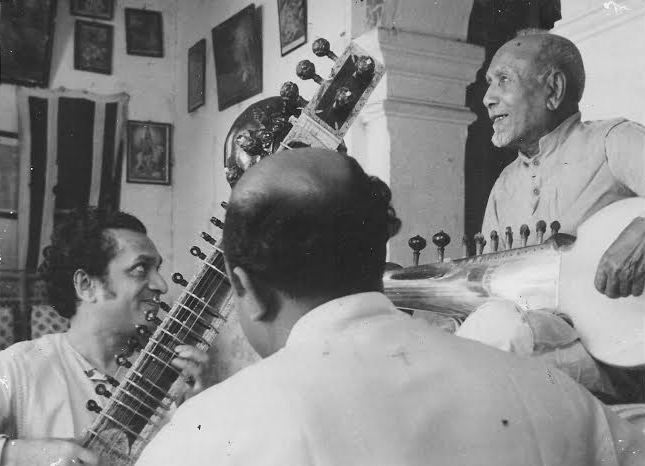 `Madina Bhavan`, his home, became a Gurukul for music. Baba Allauddin Khan taught music in a bouquet enriched with the vocal style of Dhrupad, Dhamar, Hori, Tappa, Khayal and the stringed techniques of Senia Bin and Rabab in Sarode, Sitar, Surbahar, Violin and other stringed instruments. His mastery of 240 instruments was palpable in his teaching as he worked at creating Masers of Raga and Tala in a burgeoning, norm expanding approach to music. Baba Allauddin Khan was Guru to Ustad Ali Akbar Khan (son), Smt. Annapurna Devi (daughter) Pandit Timir Baran, Pandit Ravi Shankar, Maharaja of Maihar Brijnath Singh, Pandit Pannalal Ghosh, Pandit Nikhil Banerjee, Music Directors Sachin Dev Burman and Roshan, Smt. Sharan Rani, Jyotin Bhattacharya, Indranil Bhattacharya, Sisirkana Dhar Chowdhary, Vasant Rai, Ustad Bahadur Khan (nephew), Raj Dulari Khan (second wife of Ali Akbar Khan) and his grand children- Aashish Khan, Shubho Shankar (son of Ravi Shankar and Smt. Annapurna Devi), Dhyanesh Khan, Ameena Perera, Pranesh Khan, Amaresh Khan, and Rajesh Khan . In 1955, Ustad Ali Akbar Khan and later Pandit Ravi Shankar introduced and popularized the Maihar Senia Gharana across the world attracting hordes of students to become part of this grand legacy. Their music flowed across concert halls and movie scores, theatres and institutions. The tradition thus set up is now known as The Baba Allauddin Khan Maihar Senia Gharana and its prowess and influence remains a beacon for all serious students of music. Boro Baba never sat still for a minute. He would draw and paint and make paper cut outs to decorate his home. His travails had made him a good cook and he would often offer advice to his children on how to make a particular dish and he personally went to the market to buy the right ingredients; (his market visits were a time we welcomed because it spelled not having to tiptoe around the house). He remained a vegetarian all his life and would eat fish but no meat at all. He was an avid gardener and would work in the garden while his students, especially Dadu (Ali Akbar Khan) practiced to keep an eye on them and shout corrections if a note or beat went awry or even a pause ensued. He micro managed his farm and was especially concerned about the well being of calves and their mother cows. I remember huge cauldrons of grain being cooked on our earthen stoves for special meals for the birthing cows. Boro Baba and his brother Ayet Ali Khan also set up a small business for the repair of music instruments. In fact, this business also had the voluntary services of Dida (Zubeda Khan) who had, under the tutelage of her formidable but equally lovable father in law become an expert at making the plectrums the for Sarod. In the process of repairing instruments, Dadu also created new instruments such as the Chandra Sarang, Sarang, Nal Tarang and Sitar-banjo) and fashioned the Sarod to its present day perfection. Between all of this activity, Boro Baba would pray five times a day and walk up the hill to the temple of Ma Sharada. And he would pen down his notes and compose … New Ragas like Madan Manjari (named after his wife), Prabhakali, Swarasati, Shobhavati, Madhavasri, Hem Bhairav, Madhavgiri, Bhagvati, Hemant, Hem Behag and Manjh Khamaj. He created the first Indian orchestra, known as a Maihar Band or Maihar Vadya Vrinda and devoted good time to his every activity, always in synch with the melodic rhythm he had carefully nurtured within. And it is to this spirit of utter and blissful equilibrium that one offers one’s love and pranam on his birth anniversary. Steadfast in his resolve to follow in the footsteps of his great grandfather Acharya Baba Allauddin Khan, his grandfather Ali Akbar Khan, and father Dhyanesh Khan, Shiraz is determined to break his way through the music circuit as a promising sarode exponent. As a budding talent of the present generation, Shiraz is making a sincere attempt to carry on the lineage of the exalted Maihar Gharana.